You are absolutely right, but as per usual every player who pretend they've being patient, and learned the mechanics, when in reality they've dumped insane amounts of cash into the game,which is obvious by the fact they are using new players who can't be 7* gear 11 or higher unless they've bought piles of character cards, and gear cards, these are the people who insist that it's not the battle, it's you. It's a load of nonsense!! Like every other legendary character event, yes it gets progressively more difficult as you go on, but in this event, to go through levels 1-4 seems to be a breeze, then to get to tier 5 and it's just an impenetrable wall is ****! The opposing TM is just insane! By the time your first turn comes around, the computer has had all of them have shot (most more than 1 turn) half your squad is yellow if not dead, not to mention to make matters worse it seems like most of the opposition shots remove large amounts of TM from you. I'm not saying it's completely undoable, but to sit here and have people say that it's a balanced fight, that's nonsense. Legendary events in the past have always given warning in the event tab. Letting people know something is coming. Other than vague announcements in the forums talking about possibilities with no real timetable whatsoever, it frustrates some people, so they vent and hope that for once people would post and give tips and help, not to be bashed by credit card Jedi, who have no idea what it is to work hard at something only to smash into a wall. For once I thought I was getting lucky, and was gonna cash in on the first time this event came along. Full 7* group all gear 10, and gets owned by the tier 5, and whether people wanna believe or not lots of people are having the same issue only 1 person in my guild got c hewie, and that's after 4 hours, and he lucked out in the end. Just because everyone doesn't post about this doesn't mean that only a handful of the players are having a problem. Anyone who is gonna pretend that the opposing team's TM aren't insta-filling are most likely people who have bought their way through difficult events, and have ZERO idea what is to have to grind daily to be able to keep up, or just people who enjoy contradicting people, and enjoy starting trouble in forums. I'm with you Coolnessda!! This event is not set up for regular everyday players. This is so incredibly inaccurate. You must be a very new player. If you’ve been around for a while it was easily done without spending a single dime on BH. Many in my guild 7* him with zero money spent. Nerfing this event would be a slap in the face to those of us that have spent time and resources developing BHs. There have been hints that BHs were needed earlier this year. The event does not need any nerfing, it‘s ok how it is now... even though I could only 6* it this time. It caught me off guard, but come on... did you really think it would be the same difficulty as a legendary from 2.5 years earlier??? Just completed it tier 7 without Bossk. Used the Ahnald method, having a G12 Boba/Dengar certainly helped. Not gonna lie, probably took over 100 attempts to get the RNG to go my way but got it! You know, its really sad what we've become, the amount of whiners in this thread is mind boggling! And I don't mean this as an insult I'm actually bummed about humanity. -No matter how some of you will try to twist it, this is a free game and Chewy is free content. If you farmed bossk from day 1, and by farmed I mean doing at least a reset a day for single hard node characters, you should have Bossk at 6*, 7 if you're lucky. -Special events aren't meant for EVERYONE every time. Some people were prepared and some weren't, those that weren't will have more than enough time to prepare for the next one. -If they launched a nightsisters raid tomorrow I wouldn't even consider attempting that event as I am no where near prepared but I'm betting at least HALF of you would be. So is that unfair to me? I started farming for Bounty Hunters the day Bossk marquee launched and I lucked out with this event. The list could go on and on but the bottom line is this event is nothing new with the exception that you can't throw the bare minimum at it for a free win. Its Raid Han that everyone actually has an issue with. This event just has a regular arena team but with more health/protection/speed than you can find in your shard. With the Thrawn event you had Deathtroopers with special buffs just to make it extra difficult. This one doesn't use any cheap gimmicks. The legendary battle is no different than facing the same team in arena but with better mods than you using bounty hunters. The RNG aspect is that Raid Han goes first and hits extremely hard. 30k on a special, stunning the target and gaining 90+% TM is something we've been doing to everyone else for months and during the Rebel meta. Its what makes him a great toon. The perceived difficulty comes from how great Raid Han is. The other issue is that the counters to Raid Han is muted by Guard buff. The final tier is just a really strong arena team that everyone has in their disposal (except chewbacca). Greedo, bane and Dengar didn’t even have omegas. My mods weren’t that good either..basically whatever decent ones I had that wasn’t equipped. Only Boba and Bossk has speed over 200. Dengar and Bane had 164 and 152...Greedo around 190. It wasn’t easy but doable. It took about a half hour to beat t7. I had the first 6 done before I got out of bed. people have been doing this all over the forums, " oh i unlocked him" you didnt unlock the full character. you unlocked a 5* version that you cannot use in t6 or higher raids or for the jedi luke event he will be required for. 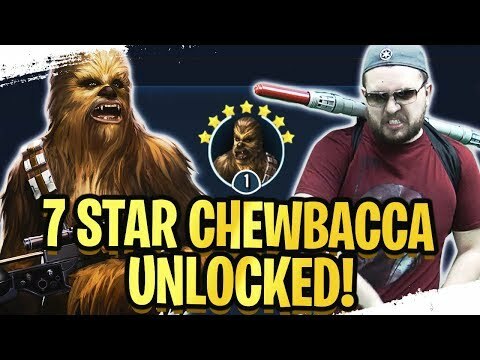 lets be really clear on this 7* chewie will be required for the 7* jedi luke unlock. 5* chewie is not going to get you there and the new requirements for legendary characters is now apparently most characters at g11/12.. thats a big jump in farming time for new players. It would be one thing if you had 5x 7* g11/12 characters who were used to unlock a legendary from their own faction so you could replace your weakest fifth with a brand new legendary but, they are setting up the game so people have to gold-farm entire factions they dont want anything to do with in order to unlock the characters they DO want to play.... this game for many (most?) people is about collecting and playing star wars characters they are enthused about.. being forced to farm rose and holdo to G12/zeta in order to unlock a legendary for the first order (my arena team) is going to be the point at which i just quit and i made this account at launch. Hit chewie first with execute followed by solo rolo lando and finally r2 you can at least get 6 star. Technically you CAN attain this as a FTP, but it is disingenuous to say that it would be typical of FTP players to actually have these toons on hand given all other competing characters to develop and gear. Something to work toward, but FTP will have to dump pretty much all resource into the BH farm if they aren't already at that level. KOTOR toons? Nope, so likely miss whatever they're up for too. Farming Scion still? Think again. Finishing up a smuggler faction for the event? Nuh-uh. Pilots for fleet? Pfftt. He didn’t use all his G12....look at the ones he used. The only G12 that you HAVE to use is Boba Fett. I’m not sure you need to throw all resources at BHs....I’m pretty certain I’ll have 6* this time round (5* with G8/9 FTP....trying to get Boba to G10 and then will follow the Boba/Potency strat). My mistake, G11 Cad and G7 Greedo...So, 3 G12, 1 G11, 1 somewhat normal expectation for a FTP. I have my doubts that's the squad he ACTUALLY uses though considering the claim was "no zetas" but we clearly see at least 2 in the characters her shows. At any rate, we're still talking HEAVY investment for FTP to get to G12, or even G11 for most of these toons. Ever looked at the gear required to get Boba from G11 to 12? Lots of raid gear RNG and/or Guild currency required for just 2 of those pieces. ALL of the pieces are required for other characters, and that's just 1 gear level on 1 toon. So, let's stop pretending this was at all something most FTP players could adequately prep for. Either the FTP player ALREADY invested in these toons MONTHS ago because they liked BH, or they are currently up a creek because we had about a week to prep for what we would typically expect a Legendary to be, not 2-3 gear levels above Thrawn. There are many posts both here and on reddit showing people getting 7* Chewie with only Boba at G12 without Bossk or Zetas. Yes, many after scores, if not hundreds of attempts. That is NOT a good way to design a game. Just saying. CG/EA has the data. You want people playing the game and enjoying it. Not reloading one part hundreds of times, doing something else during the redundant cut scene, then reloading again after bad RNG kills 3 g12+, 6* modded characters before they move. We already get to do that several times a week....it's called the Sith Triumvirate Raid. You're overlooking the fact that people are trying to do this with undergeared characters. That's why it's taking so many attempts. To experience the event as designed, use the requirements opposed to trying to put a square peg in a round hole. If you want to try to bypass the requirements it will take time, strategy, and some good RNG. Actually the only true requirement is having a 7 star Dengar with a minimum of gear level 7.... He was the deciding factor in this event which is why they added in R2 despite the fact that R2 was with Luke at the time in a different star system in the movies. Without Dengar you can't counter R2s smokescreen and even with a G12 squad, zetas and a zBossk lead tTier 7 of the event is nearly impossible. After wiping on Tier 7 non stop for 2 straight days with a G12 260 speed zBossk lead and the rest of my squad all G10 with 200 - 235 speed and my best mods. I finally buckled and bought 25 shards of Dengar from the weekly store and blew Crystal's and guild points refreshing and buying Dengar shards to finish getting him to 7 star. After that I replaced Greedo with Dengar who was only G7 and went in and 3 started Tier 7, unlocking 7 star Chewie after only 4 attempts. This is by far the worst and most infuriating event I’ve ever seen in this game. I’m seriusly considering leaving overnit. It’s lazy, and just not fun. Im not going to waste hours of my life waiting to roll a bunch of dice that have to roll perfectly for this. If Han doesn’t stun Boba, reset. If Dengar doesn’t get stealth immediately, reset. If Rolo puts ability block on Boba and Greedo, reset. If two BHs die in the opener, reset. I thought the Thrawn event was bad, that was nothing compared to this. Very poorly designed. Another 10-15 shots, and I’m done with this game period. Been playing for years and have over 3m GP. If this is what the game is going towards, I want no part of it. I already quit Marvel Strike Force over their bull sh*ttery. After that I replaced Greedo with Dengar who was only G7 and went in and 3 started Tier 7, unlocking 7 star Chewie after only 4 attempts. I have Greedo G8 and Cad on G 10. Should I continue to try with the lead of Boba or change the mods and try Bossk? I tried Bossk a few times but the same result. How else can they scale difficulty? Its the same with most other games. Opponents are faster or have higher healthpools or defense or whatever. And that is a general principle. Even in games like Civilization the opponents simply had more resources and acquired them faster on higher difficulty levels. Even under Boba, other mods can serve you better. For example Boba wants speed rather than potency (while keeping potency cross, of course). Any chance you could take Greedo to G10 or so? He can be very helpful, with tm reduction, detonators and a chance at machine gun. It took me 20 attempts to realize that Rolo zeta lead was active and once I found I knew how to proceed. Still it took many more attempts to get the perfect situation for my 1st turn. The RNG part of the event opens a window for everyone, prepared or not. They did that for Yoda. The first time around was incredibly hard. Took me over 100 tries to get him and when he returned, they said they tweaked it and my friend breezed through it. I did it after maybe 30 tries with zBossk, boba g12, CB Ig88 g11 and Dengar g9 , big difference for me since start of event has been to be able to grant 3 g12 pieces (easy ones) to Bossk and the omega on Dengar's AoE. First gave more survability to Bossk and second was the key for victory (plus the good amount of RNG of course), triggering a good chain of event that allowed me to get BH bounties ON killing lando (and reload Boba revive) then kill Chewie wth mass attack on him and then the rest was "easy" (not sure this word applies here), only lost Ig88 . I got 5* Chewie today with Boba G9 lead, IG88 G9, Dengar G9, Cad and Greedo G8. All were wiped out except Boba facing ROLO and R2, got ROLO, Boba died and revived, and killed R2 at last! Pure luck, but made it nevertheless. I think there's no need to throw all potency mods to all team members. I put 2 health mods to IG88, Dengar, Cad and Greedo (with potency secondary), and find it better than all potency mods. I got Chewbacca yesterday using g9 Boba lead (238 speed), g11 IG-88 (228 speed), g9 Greedo (218 speed), g8 Dengar (212 speed), and g8 Cad (199 speed). The team had a total of 151.47% potency. As someone who is on a launch shard for arena, this is simply not true. I have my 6* arena mods on several of my g12+ BH - and they still act after every one of the Rebels in the 7* tier. No one, not even launch whales have mods like the T7 Rebels do. And the fact that they are a "regular arena team, but with more health, protection and speed" is the cheap gimmick. Especially when you consider the fact that CG has stated, clearly and plainly that BH are by design, weak versus arena teams. On one point I do agree - CG/EA super-charged a Rebel arena team with God-mods and abnormal health & protection. And then said "Go beat them with the one faction we've designed to be weak against arena teams. May the force be with you!" So yeah, that's the reason for the complaints. Several hours of moving arena mods on to a team that isn't designed to compete against arena teams. Then spending hundreds of attempts over numerous hours all decided by who lands a stun or who gets ability blocked is poor game design - which is CG's "fault". And they could have designed some of the randomness out of the event. It would have been very simple to have R2 always smoke screen first, or always burn first - but they didn't. Despite acknowledging that that same "randomness" is what makes the STR and restarting over and over so frustrating - and worthy of a change. ETA: I've played this game for over two and half years. This is the most unfun event I have participated in yet. Yes, including HSTR. At least that I only have to do a handful of runs and can use different teams. If had to rank all of the legendary events, this one is dead last - and it's not even remotely close. Very disappointed in this event and the direction CG is moving with this game. Agreed with this 100%. I've been playing since launch, have over 3.5M GP and can place top of Arena. This event is Horrible compared to every other Legendary or Heroes Journey event. The RNG factor is infuriating. I've been doing this event for days/hours now and cant even get him at 6* with a well geared and modded BH squad (no Bossk but I have zBoba G12.3 lead). Even the damage from Boba is totally random. IF (big IF) I get a decent opening I can have Boba knock Chewie down to a sliver of health one battle and the next he barely takes off half Chewies protection. Same buffs on Chewie. Been playing for hours so I have seen it consistently. I know I am not ready for 7* but even 6* is a total joke and T5 was ridiculous just to unlock him at 5 stars. This is a game and games are supposed to be FUN not maddening. Oh, and just to clarify - so people don't think my issues with the event are related to success/failure. I DID complete the 7* version of the event. I HAVE 7* Chewbacca. And it didn't feel like it was an accomplishment. It was boring and lame and I hated every minute (hour?) of it. in all fairness, it probably wouldn't have taken an hour if you had the recommended gear levels and bossk. So in a way it is related to success/failure. If you were able to clear the event in like 3 to 8 attempts, it would have been a more pleasant experience. I didn't enjoy the event itself either, but that's mostly because i went in severely undergeared and was forced to rely on perfect RNG. It did feel like an accomplishment for me though and admittedly a fair bit of relief that it was finally over. Especially the cutscene was taking it's toll on me. I personally feel like the RNG aspect of the event wasn't that bad, as a matter of fact it's the only reason i was able to get a 7* chewie with my g12, g11, g10 and 2 x g9 team without bossk or zetas. Unfortunately i wasn't able to "test" the event with the recommended gearlevels and bossk (perhaps even jango, aurra and embo) to see if my suspicion is correct. I think alot of players here on the forum are upset because they were expecting a significantly easier event. Had we known that it would be this difficult, there would probably have been less frustration. The question remains whether the recommended/required gear lvls (and to a certain extent having bossk) were reasonable if we hypothetically take the RNG aspect and the expectation/reality aspect out of the equation. I don't know if i'm being honest. This is not the case, and that is largely the issue. Even if you did have a full g12+ squad with the "right" characters, it still took a couple dozen retries. Thanks for summing up my thoughts exactly, I'm just tired of wasting hours on this event because of the rng...with the squad I have built up, I need han to stun Boba, r2 to not smokescreen, bossk to not get ability blocked...you know how many times that happened in an hour last night? Maybe 1x or 2x. and it is even more frustrating as they acknowledge this gameplay is what hurt the sith raid. Why bother anymore? What's next, g12 all the ewoks? Make sure you have the right ones! Or get ready to waste more hours of your life on horrible gameplay! I have 7 gear XII BHs (Zam, Cad, Boba, Bossk, IG88, Dengar, Greedo) and I cant beat Chewie gear 12 yet- ideas helpful. I'm reluctant to believe that. A couple dozen retries with the right team/gear/mods and strategy is definately too much though.